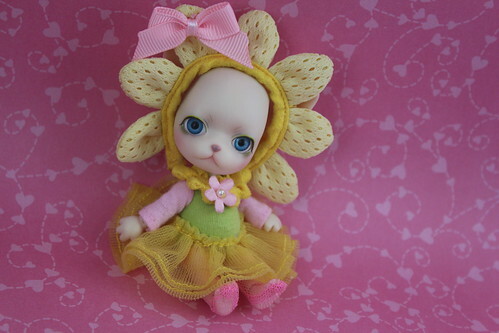 Pang-ju are tiny anthro bjds made by Groove, they resemble a Chihuahua or maybe a cat? Last year, I bought Cranberry-Pang who I reviewed here I actually quite liked the little darling and had been pining for more particularly Flower-Pang and Pome-Pang ever since unfortunately other priorities got in the way. 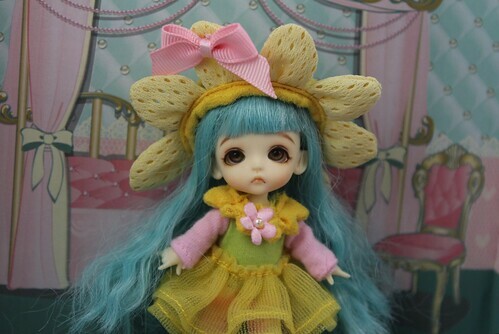 Recently Pullipstyle slashed the prices on many different Pang-ju including Flower-Pang and Pome-Pang are priced at only $50. Of course, I was powerless to resist the little darlings at a bargain price so I immediately ordered Flower-pang and Pome-Pang. I unfortunately missed out on Chiffon-Pang. 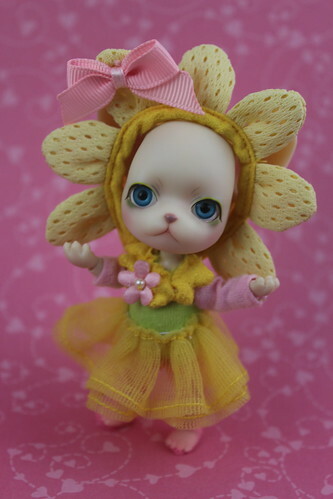 Some additional general information about Pang-ju, they are ball jointed dolls but they are not made out of resin so they may be considered off-topic on some forums such as Den of Angels. Despite the fact that they are not resin, they work like a regular bjd they are fully strung and have removable/replaceable eyes. They are super tiny, they are only a little over three inches tall. 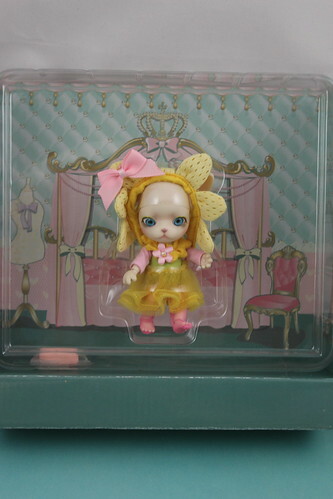 Flower-Pang was released in June of 2014 with a MSRP of 10000 yen. I think what attracted me to her was her theme, it reminded me of little kids dressing up for a play or maybe a ballet? I thought it was a really cute concept and I love the spring inspired palette they used for her outfit. The inner box for anyone curious, more on the little mystery pink brick including in the package in a moment. The inside box lining is worth saving as it makes a very cute backdrop for Pang-ju photos! For anyone curious, Pang-jus have a little mechanism to help keep their eyes in place. The eye mechanism is kind of cool it safely keeps the eyes in the head and the eyes are really tiny so they can be troublesome to re-position otherwise. With the eye mechanism out. 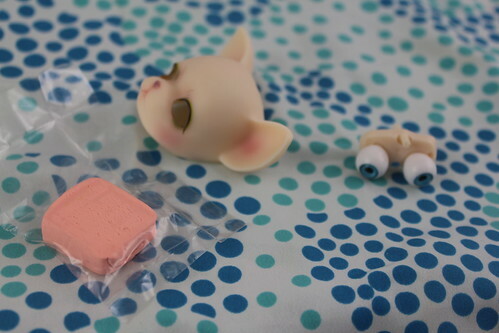 The small pink lump of stuff that is included in the box is actually eye putty, you have the option of using the eye mechanism or using the eye putty to position the eyes. The eye putty is not chewing gum please do not try to ingest it, I only mention this because I misplaced a small piece of eye putty while I was changing out the eyes on one of my larger bjds, I couldn’t imagine where it went until Mr. Klein informed me that my bubble gum tasted absolutely wretched apparently he thought it was like re-ment gum >_< . Isn’t she is darling? I decided to name her Bloom because of her floral theme. I tried to emulate a ballet pose with Pang-ju but Pang-ju is quite tiny, I always seem to have a bit of trouble handling the very tiny bjds I must be too clumsy! The only difference between different Pang-ju releases is face up and eyes, they all have the sculpt. I really like Flower-Pang’s face up it seems to give her a somewhat worried expression like she is concentrating very hard to remember what her next line/move is supposed to be. I also really love the colors that they chose her face up. I also love her bright blue eyes. The costume is not especially practical and definitely a bit ridiculous but I absolutely love it, it’s so cute! It’s really well-made especially considering how tiny it is, I can’t imagine sewing something that tiny. Pang-ju family photo! Berry, Bloom and Twisty. 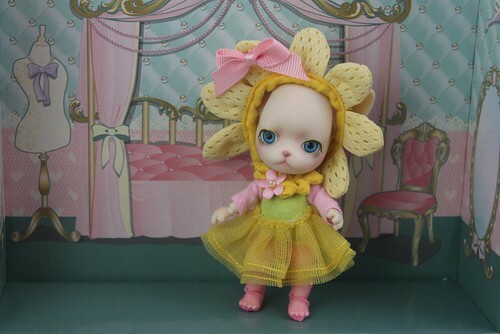 Needless to say Pome-Pang will likely be the next non-Pullip doll reviewed here. Also for anyone curious a size comparison with a Lati White. that they can share clothing! 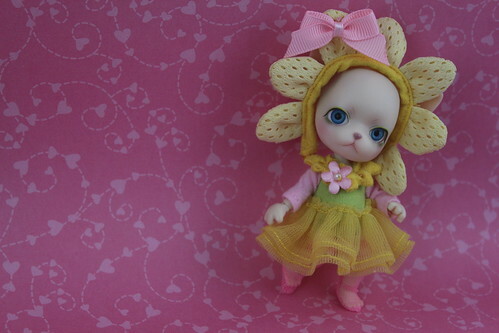 D’aww I can’t believe how adorable is Lati White Belle in Flower Pang’s stock outfit! I’m definitely very happy I had the opportunity to add this little darling to my doll family especially at such a great price, check out Pullipstyle if you find yourself wanting your own little Pang-ju! This entry was posted in BJD, Doll, groove and tagged anthro, BJD, comparison, cranberry-pang, flower pang, lati white, pang-ju, pome-pang, pullipstyle, tiny bjd. Bookmark the permalink. what size feet is pang-ju please? Pang-ju don’t have regular feet, they have paws very few Pang-ju come with shoes and those that do have cloth shoes I have yet to find any standard sized bjd shoes that fit them. I think if you wanted them to wear shoes you would have to make them yourself. Thankyou kleintoys. Would lati white shoes work?